Find out if wood rot has affected your home—and what repair and prevention methods to employ. In nature, wood rot is a vital decomposition process, turning fallen logs into nutritious soil. But few things send homeowners into a panic as quickly as discovering it their homes, because wood rot can lead to a number of structural problems, including deteriorated support posts and beams, rotted floor and ceiling joists, and destroyed roof decking. 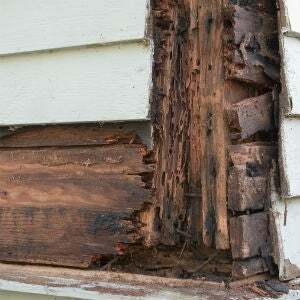 The cost to repair the damage—or, in other words, replace the rotted wood—can run in the tens of thousands of dollars. Because wood is the most prevalent building material, it’s essential to understand what causes wood rot, how to prevent it, and what to do if you discover it—discover being the operative word, as wood rot is often hidden from view beneath flooring, wallboard, and siding. Read on for the must-know info. Wood rot is a form of decay triggered by the combination of moisture and fungi (microscopic organisms). In order for fungi to set up shop, the wood must be continuously damp; fungi will not grow on dry wood. Yet as many as 5 million types of fungi exist in the air and soil around us, and there’s no escaping them. While many types, such as yeast and mushrooms, are beneficial, others are destructive. The numerous types that trigger wood rot are loosely classified by the three general effects they have on wood. Brown Rot: Often called “dry rot” because the surface of the wood appears dry, brown-rot fungi targets cellulose in the wood’s structure. As the cellulose is destroyed, the wood shrinks, turns deep brown in color, and breaks into small cube-shaped bits—a process known as cubical fracture. Brown rot thrives at temps between 65 and 90 degrees Fahrenheit, and once it starts growing, it spreads rapidly. White Rot: If wood takes on a whitish or light yellow shade and feels spongy, it’s probably white rot. Whereas brown rot affects cellulose white-rot fungi break down lignin, another element of the wood’s structure, leaving the light-colored cellulose behind. Like brown rot, white rot occurs in temps between 65 and 90 degrees Fahrenheit. Soft Rot: Soft-rot fungi decompose wood more slowly than brown-rot fungi and white-rot fungi, but thrive in temperatures too hot and too cold for the other types to survive, between 0 and 110 degrees Fahrenheit. Soft-rot fungi break down cellulose, leaving the wood with a honeycomb-like appearance, and while it is usually found in fallen logs and trees, not commonly in houses, it can strike a home if conditions are right. Where Is My Home at Risk? Because wood rot occurs in damp areas that do not dry out, it often goes undetected until a remodeling project exposes it. The following areas are the most likely spots for wood rot to get a foothold. Today’s windows are designed to prevent leaks, but all it takes is a small gap that’s not adequately sealed with caulk for rain to seep through and saturate the wood in the wall beneath the window. Because the wood is not exposed to air or sunlight, it remains damp—providing optimal conditions for fungi growth. Older wooden windows are at an even greater risk, as water tends to pool on the horizontal sills, seeping through cracks in the paint. Like windows, cracks and gaps between a door and the siding (or threshold) permit water to enter, making them prime spots for wood rot. The rot is often found when homeowners decide to install a new door. Once the old door frame is removed, the rot is visible in the wood framing. Horizontal decking boards and stair treads can also hold water. 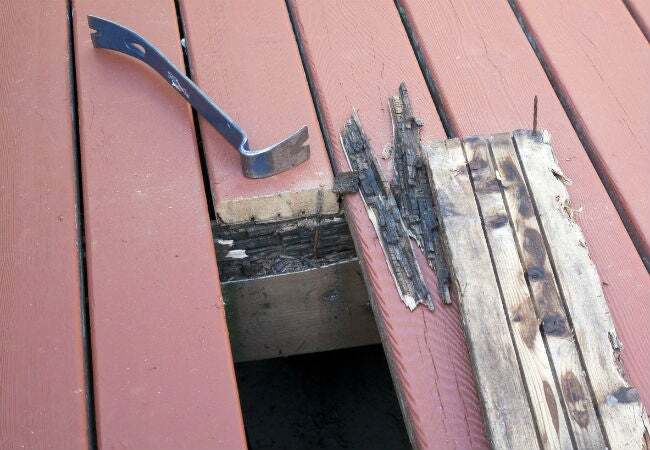 While many treated decking boards are water-resistant, they’re not 100 percent waterproof, and over time, they can rot. The bottoms of painted balusters are a prime spot for rotting; they’re typically built from untreated pine, and then painted to resist the elements. Water becomes trapped under the bottom of the baluster and doesn’t dry out, giving fungi a chance to grow. High humidity and moisture is prevalent in basements because the concrete walls are surrounded by moist soil. Humidity levels can be so high in leaky basements that water vapor can form on the surface of walls and wooden ceiling joists. Once wood rot gets a foothold here, it can spread unnoticed until it creates structural damage. Any room with a plumbed water fixture, such as a kitchen, laundry room, bathroom, or utility room (with a water heater) is at risk. Leaks around water supply lines and drain pipes keep the area wet and provide an optimal environment for wood-rot fungi to thrive. Missing or damaged shingles can permit water to seep in, and over time, it can lead to wood rot in the roof decking and in the lumber used to frame the attic. How Should I Look for Wood Rot? Checking your home for signs of wood rot should be an annual mission, and a good time to do it is during your pre-winter weatherproofing tasks. You’ll need a long-handle screwdriver and a good flashlight. If your home has wood siding, examine the siding around and beneath the windows for signs of swelling or discoloration. 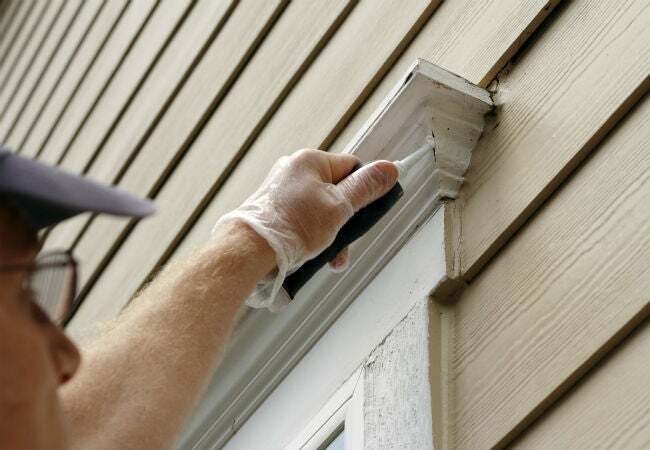 Paint can hide wood rot, so poke the siding with the tip of the screwdriver—the wood should be firm and hard. If the screwdriver sinks into the wood, you’ve got a wood rot problem. Using a strong flashlight, check the attic for discolored wood. If you find any, perform the screwdriver test. Wood should never be soft. Prime spots in the attic for wood rot are on the underside of the roof decking, in the joints where the wood members connect at the peak of the roof, and at the edges of the attic where the rafters slope down to form the eaves. Check the wood members in a basement or crawl space, using the flashlight to detect discoloration around the perimeter wood plate that sits directly on the top of the concrete basement wall (sill plate). Probe any discolored areas with the screwdriver. Examine walls and floors beneath sinks, around tubs and showers, and around the water heater for signs of water leaks or discoloration. If you find mold growing, the wood floor plates behind the wall are at risk of wood rot. The only sure way to find out is to remove a section of the wallboard and check the wood behind. Can I Treat or Repair Rotted Wood? Softwood damaged by wood rot is not salvageable and should be replaced as soon as possible to keep the rot from spreading. If the wood is discolored, but the screwdriver test did not detect softness, you can try treating it. You’ll first have to dry the wood by repairing leaks and/or running a dehumidifier. Once the wood is dry, you can apply a wood preservative that contains copper or borate, such as Woodlife Copper Coat Wood Preservative (available on Amazon). Monitor the wood because it’s still at an increased risk of future rot. How Can I Prevent Future Problems? When it comes to wood rot, prevention is the key. 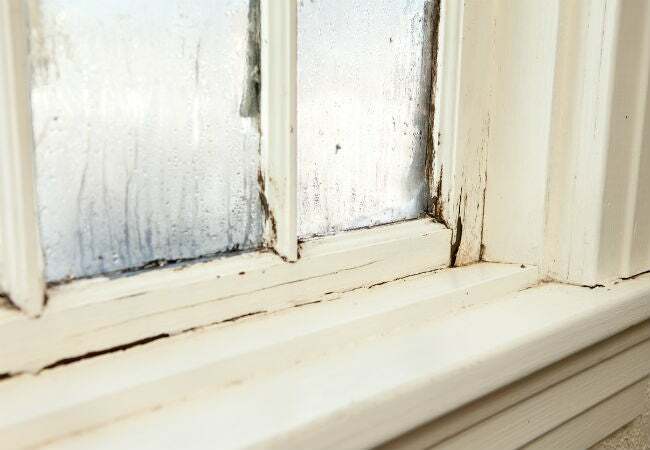 It’s easier—and much cheaper—to prevent rot rather than fix it. The following steps will help keep the wood in your house dry so fungi don’t have a chance to set up shop. Seal all cracks around exterior doors and windows with caulk. Scrape away old hardened caulk, and replace it with fresh caulk. Clean gutters regularly—at least twice a year—to prevent blockages that can lead to water running over the backside of the gutter and down the side of your home. Add a covered entryway over doors to keep rain away from the doors. Use a good dehumidifier in the basement or in any room of the house subject to high humidity. Install exhaust fans in bathrooms to remove steamy air caused by hot showers. Repaint exterior windows and siding if paint is cracking or peeling. Sweep standing water from outdoor decking as soon as the rain stops.